Protesters have disrupted the launch of Pieter-Louis Myburgh’s book, Gangster State: Unravelling Ace Magashule’s web of capture. 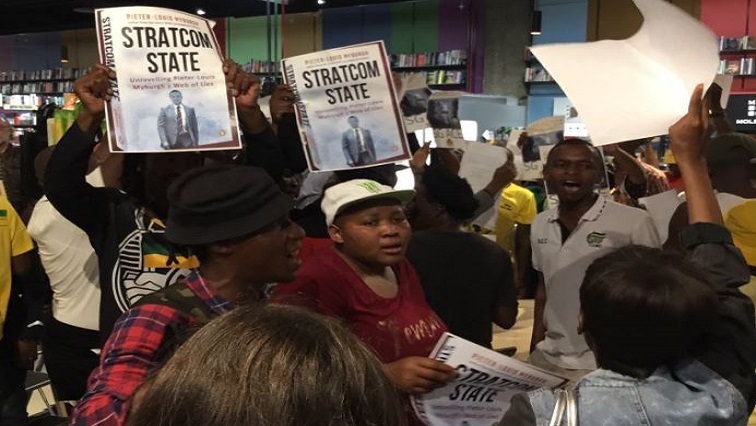 The launch of the controversial book at Exclusive Books in Sandton City, north of Johannesburg, has been disrupted by people believed to be ANC members. The book revealed explosive evidence regarding ANC Secretary-General’s alleged underworld activities while he was Free State Premier. A tweet by Pinguin Books SA shows how people, some in ANC T-shirts stormed the launch vandalising the store and tearing the controversial book. Security personnel had to be called in. In videos posted by publisher, the group are seen dancing and singing as mall security guards in orange vests surround them. Meanwhile, The African National Congress Youth League (ANCYL) in the Free State Province is set to burn books on Monday at the Mangaung South Side dumping site. “We have arrived at this sober decision driven by our deepest sense of a need to maintain a clean environment free of garbage such as this one produced by this strat-com product,” says ANCYL spokesperson Sello Pietersen. The party says it is common knowledge that “this rubbish” is not only badly written but poorly researched as well, with the sole intention of casting aspersions on the character and the person of the Secretary General of the ANC. “We wish to state it categorically that we are unapologetic about our support to the Secretary General of the ANC, Cde Ace Magashule, who is a tried and tested product of the African National Congress, nurtured, grilled and baptised in the traditions and values of our movement. We therefore do not need any endorsement from white monopoly capital agents regarding his struggle credentials, we know them and shall defend him,” says Pietersen. The African National Congress (ANC) distances itself from the disruption of the launch of the book, Gangster State in Sandton. The ANC appeals to all its structures to observe and adhere to the letter and spirit of our Constitution. The post Protesters disrupt launch of book Gangster State appeared first on SABC News – Breaking news, special reports, world, business, sport coverage of all South African current events. Africa's news leader..